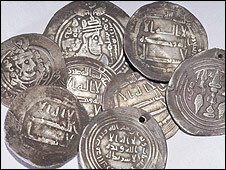 Swedish archaeologists have discovered a rare hoard of Viking-age silver Arab coins near Stockholm's Arlanda airport. About 470 coins were found on 1 April at an early Iron Age burial site. They date from the 7th to 9th Century, when Viking traders travelled widely. There has been no similar find in that part of Sweden since the 1880s. Most of the coins were minted in Baghdad and Damascus, but some came from Persia and North Africa, said archaeologist Karin Beckman-Thoor. 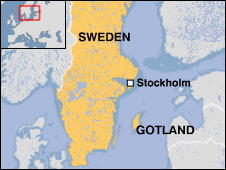 The team from the Swedish National Heritage Board had just started removing a stone cairn at the site "when we suddenly found one coin and couldn't understand why it was there", she told the BBC News website. "We continued digging and found more coins and realised it was a Viking-age hoard." The coins were left there in about AD850, she said. Such Viking hoards usually come from Gotland - a large Swedish island in the Baltic Sea, she explained. "No Viking was buried at this site - the grave is older. Maybe the Vikings thought the hoard would be protected by ancestors," Ms Beckman-Thoor added. Vikings had settled in a village nearby. The Vikings travelled widely in their longships in the Baltic region and Russia from the late 8th to the 11th Century. They are known to have travelled as far as North Africa and Constantinople (now Istanbul).